First pit stop en route to the Peak District is Chesterfield. 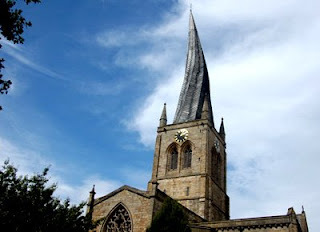 Having passed the town's most famous attraction - the crooked spire - countless times on the train from Euston to Sheffield, I decided to stop and take a closer look. It really is quite an arresting sight. The steeple of Derbyshire's largest church, St Mary's and All Saints, twists 45 degrees and leans nine and a half feet to the south west. The church was largely constructed in 1350 following the Black Death outbreak and the spire was added later in 1362. It's wonkiness is attributed mainly to a dearth of skilled craftsmen at this time and their use of unseasoned timber. There are (of course) several more colourful explanations including the story of a local blacksmith who was so nervous about shoeing the devil that he drove a nail into his foot. Leaping over the spire in pain, legend has it that the devil knocked the spire out of shape. Not being particularly scientifically minded or inclined to figure out how this feat of botched engineering has remained in place for over 600 years, especially on blustery days like today, I beat a hasty retreat (in what I believed to be a north-easterly direction) to the nearest coffee shop.